Of all the books I’ve written, I used to be most proud of the backpacking and camping books, because they were so much more work than the cook books and remedial readers I had previously written. As I look at them now, Camping with Kids, and then the others, variations on Backpacking with Babies and Small Children in chronological order, I am still proud of the work I did to create them–interviewing, finding illustrations, making decisions about organizing the material– and how much I learned in the course of that work, but now I have a new book, Show Me Your Face, a work of fiction, my first novel. I think all writers of non-fiction books have a fantasy that some day they will write a novel. My book is a love story, but in writing it, I learned about paraplegia and domestic violence. I am just as proud of this new book as of the earlier ones, and I hope my readers will learn a lot from all of them. Show Me Your Face (CreateSpace), my most recent book, is available on Amazon as a paperback or Kindle e-book. It was released in January 2015, but it had been cooking in my head since the early 1980s. I had accompanied my husband to a meeting of the American Academy of Physical Medicine and Rehabilitation in Baltimore. At the end of a day of sight seeing, I returned to the convention center to look for him. The lobby was dim and deserted, with a silent escalator running up two stories toward the ceiling. As I stood there trying to decide what to do next, a man in a wheelchair rolled out from the shadows on the other side of the room. I don’t know if he saw me–he gave no indication that he was aware of my presence. He rolled up to the escalator, put his arms out to the moving handrails, rode up to the top and disappeared. I thought, what an amazing man, bold, daring, sure of himself. I decided then that I would write a story about such a remarkable man. That’s how Kevin Corwin was born, a gorgeous man who drives a white convertible. Summary: Everything is new and strange for Molly Bennet, a young widow who has never worked outside her home. She has moved across the country to Seattle where a friend has offered her a position in a new field, and she has met Kevin Corwin, an enormously attractive, kind, generous, attentive man who uses a wheelchair. 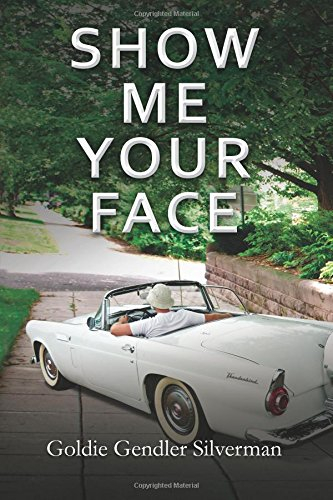 Molly prides herself on learning to understand and accept his disability, but as she becomes more knowledgeable about her new job at SCAWF, Seattle Center for Abused Women and their Families, she begins to suspect that Kevin may have other, less attractive qualities. Readers of this novel will learn much about domestic violence and also spinal cord injury. 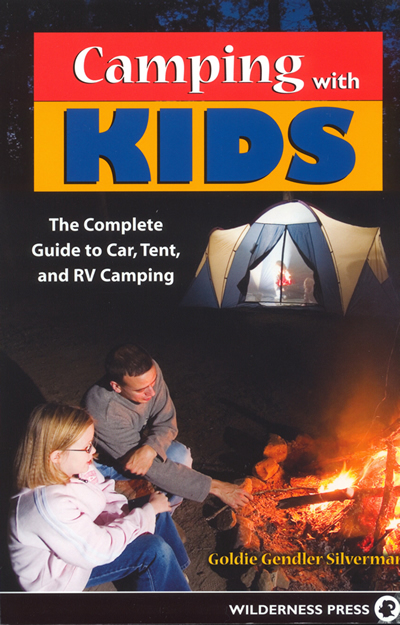 Camping With Kids (Wilderness Press), sub-titled The Complete Guide to Car, Tent, and RV Camping, had its first printing in January of 2006. The idea for the book came from my publisher, Wilderness Press, whose marketing department believed that people weren’t backpacking so much anymore, but were choosing more comfortable ways of camping, like setting up a tent next to the car or camping in an RV. I don’t necessarily agree with that thought, but it’s not often that a publisher requests a book from me, so I agreed to do it. Before I began to write the book, I knew I needed to research the subject–I could write about the way my family camps, but I knew from my earlier books that every family has its own way of camping, and that there is no one right way to do it. I wanted to offer readers many choices, so that they could determine what would be right for their family. I set a goal of interviewing at least 100 individuals for the book. Actually, I interviewed more than 120. Some were young campers in two middle school classes that I visited–after I talked to the kids, their writing assignment for the week was on camping, and they gave me wonderful information. I also talked to parents, to park rangers, to campground managers, to leaders of organizations that take kids camping, to specialists on safety and on packing and on every other subject that I could think of. Two friends supplied me with wonderful photos, and Don and I took a few also. The result is 250 pages crammed with everything you need to know to take your kids camping. Special features include Expert Advice, from kid and parent campers; Quick Quizzes, to help you choose the best camping style for your family; Helping Hands, tips for getting the kids involved; Imaginary Camping, ideas to help you prepare for your excursion; and Checklists, to keep you organized. This book is available from Amazon, or ask at your favorite bookstore. My job writing remedial readers for the Phoenix Reading Series, published by Prentice Hall, ended. I was at loose ends. Casting about for a new writing project, I contacted Louise Marshall, the editor and publisher of Signpost, a monthly newsletter for hikers in the Northwest. Louise told me that their staff had asked readers to submit ideas for a book on backpacking with babies and small children, but no one had time to put it together. I had time! The publishing agreement between Signpost Publications and me was only a half page long. The information they had gathered from their readers provided about one quarter of the final work. A second quarter was drawn from my own experiences, and half came from further interviewing of backpacking parents. Louise’s daughter, son-in-law and two grandchildren, and Don and I and our youngest son and a friend of his, went out with a photographer to shoot pictures for the book. Signpost provided additional illustrations, including cartoons by a well-known editorial cartoonist. The price when the first edition came out was $4.50, but by the time of the third printing, 1979, it had gone up to $5.95. 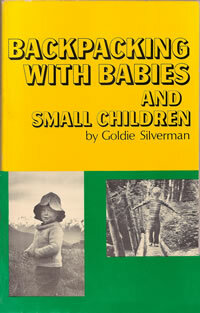 The first edition of Backpacking with Babies and Small Children went through several printings, and then it went out of print. Signpost Publications stopped doing books to concentrate on the newsletter, which by this time had grown into a monthly magazine. The half page agreement between us proved to be a problem; breaking up is hard to do. (Every book contract I’ve signed since then has pages and pages on going out of print, regaining rights, etc.) I did get a letter from Signpost restoring the rights to me, and I found a new publisher, Wilderness Press in Berkeley, CA. I completely re-wrote the book, including all new illustrations, which I was responsible for finding myself. Again, I contacted many people to add new information to the book. 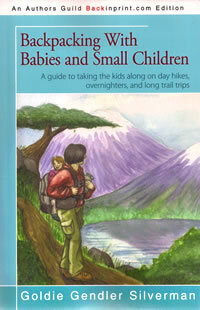 It was sub-titled A guide to taking the kids along on day hikes, overnighters, and long trail trips. The fourth printing came out in March, 1994. When Wilderness Press asked me to revise the book for a third edition, I did the same thing I had done for the first two: I asked a lot of questions and gathered a lot of information from many different people. Where the second edition had only 122 pages, the third has 166. It also has lots more illustrations. 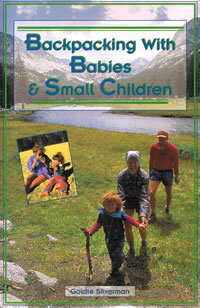 The back cover says that this book takes advantage of years of trail-tested wisdom and great tips for keeping little ones safe and content in the outdoors. Then that one too went out of print, although you can still find it at used bookstores. When the third edition went out of print, I felt very sad. 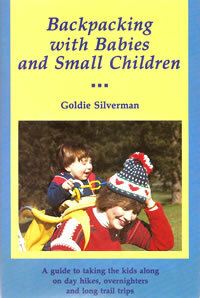 I knew it was still full of good, sound information that would be useful to backpacking parents. I wrote Camping with Kids, and when I gave book readings or talks about that book, I mentioned Backpacking with Babies and Small Children and people wanted to know where they could find it. They wanted to own both books, and all I could say was, “Go to a used book store.” Then I learned that the Authors Guild, a national organization for writers, had a program for its members, in cooperation with iUniverse, a company that does print on demand, to bring out of print books back into print. I had allowed my membership in the Authors Guild to lapse, but I quickly paid my dues and became eligible to have my book published as An Authors Guild Backinprint.com Edition. I had to supply iUniverse with two copies of the latest (third) edition of my book. The book was scanned, and it’s now in the iUniverse giant computer and available to readers once again. This edition is exactly like the third edition, except that it has a new cover, a new picture of my latest grandchild opposite the title page, and a couple of replaced drawings done by my older granddaughter. Everything else inside is exactly the same as the third edition. The new book is available from iUniverse, from Amazon, and from Barnes & Noble. Dear Goldie, We’ve so enjoyed looking at all this on line. Have a good time on your wonderful trip when we will MISS you in Northampton, but your website and information about your books will be on the blog that I’m in the middle of building. Will try to have/post short videos of Reunion 2014 with people just like you in mind. P.S. Will correct the phone of the person who wasn’t there.